Inspired by fashion and love (or my love of fashion - lol) this card came to life after seeing the beautiful dress below and discussing anniversaries with a friend. Hand-stamped cards can say so much - even with out a greeting! 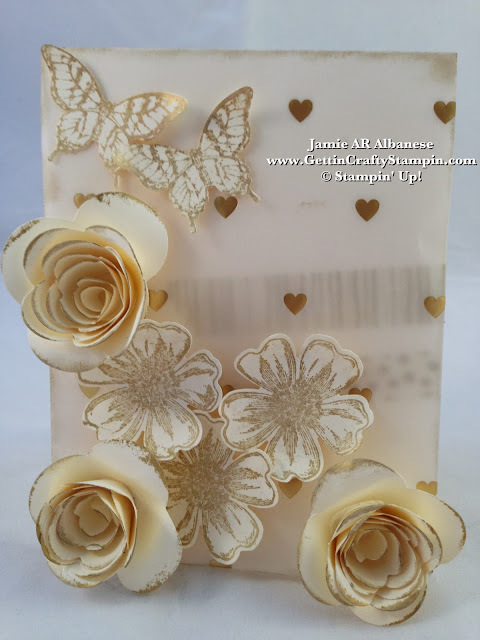 *Bring Home a beautiful hand-stamped gift and the NEW Occasions Mini Catalog when you email me at Jamie@GettinCraftyStampin.com your name, number and best time to call. I'd love to call and create a hand-stamped gift just for you! 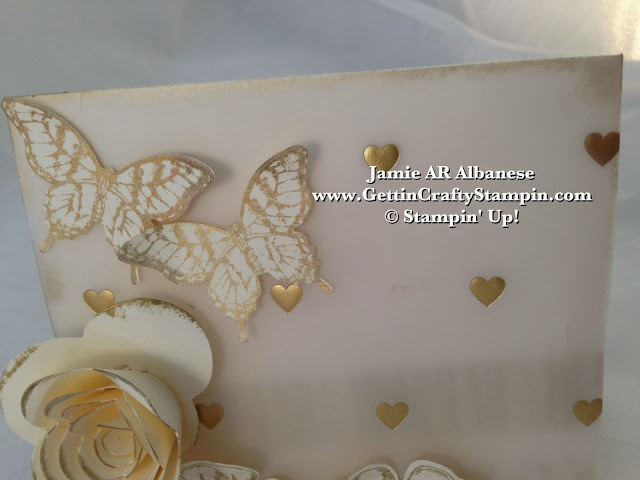 Create beautiful hand-stamped butterflies, flowers and 3D gilded roses by stamping the pretty pansy in the Gold Metallic Encore Pads on the Very Vanilla card stock. The coordinating punches for the Flower Shop bundle (and who doesn't LOVE Saving on a Bundle!!) and the lovely Papillion Potpourri and coordinating Elegant Butterfly punch. Inspiration comes in all shapes and sizes (does thissss come in my shape/size?!?!). This beautiful dress, pinned on Pinterest, is a fun way to feel my card-mojo come to life! Layers, sheer and added sparkle.. this card picks up the subtle beauty of the dress! Here with the Watercolor Wonder Wonder Designer Washi Tape under the beautiful Gold Fancy Foil Designer Vellum. 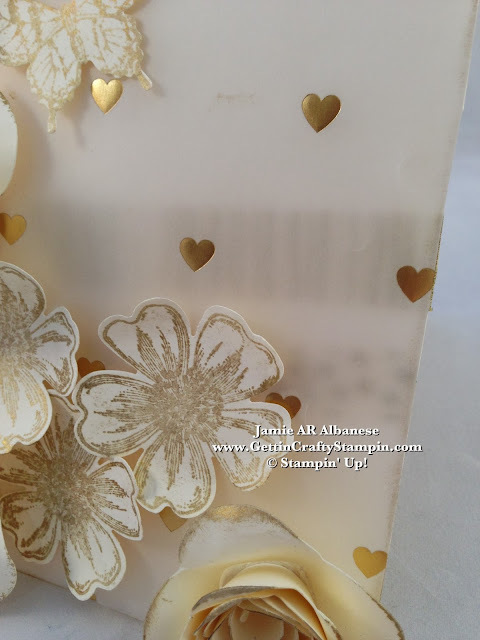 Subtle addition and layer easily achieved with this pretty gold patterned washi tape. Add some more gold (can one ever have ENOUGH Gold??) 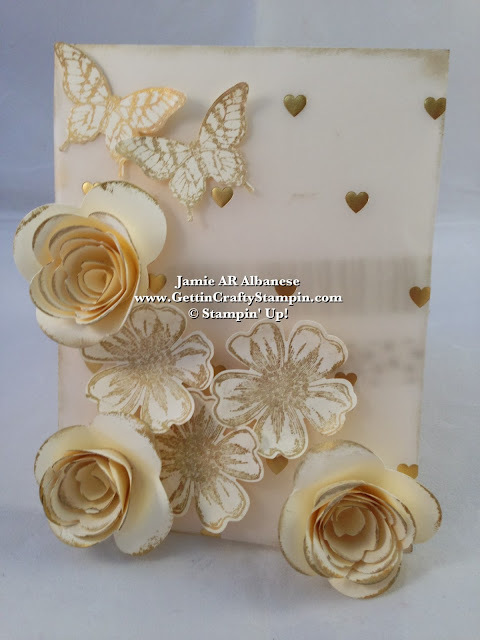 with the Sponge Dauber in the Gold Encore pad and rubbing the edges of this Very Vanilla card. 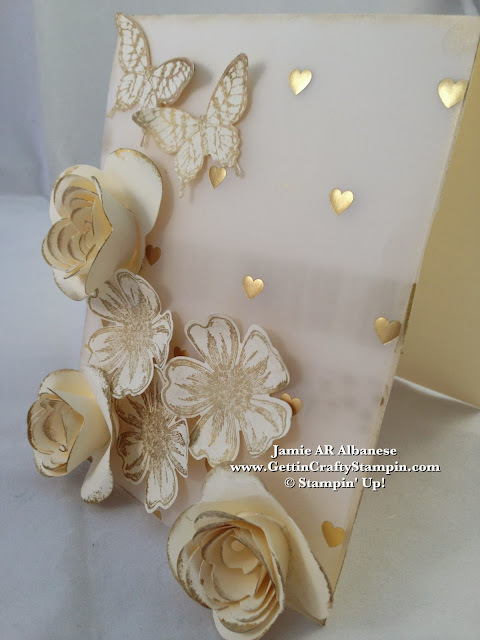 Gilded edges are a great way to wrap up this card. 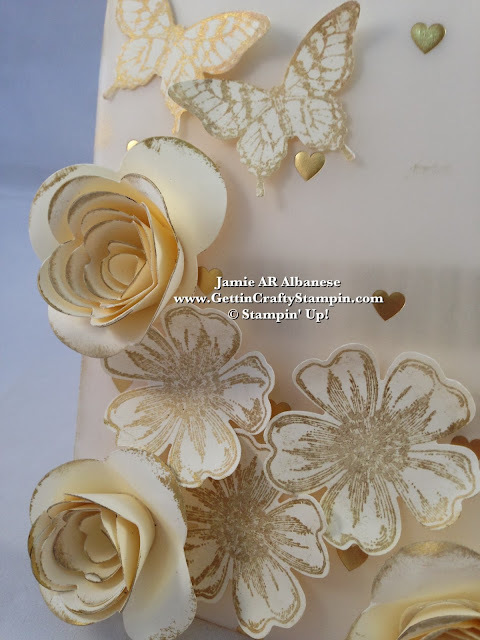 Gilding the edges of this Spiral Flower Originals Die that creates these beautiful roses! Using my Hot Glue Gun to adhere the 3D rose together on the base it comes cut with. I curled the edges with my Simply Scored Stylus for a softer look. Gold doesn't go out of style... celebrate love and life at a wedding, anniversary or just because! This card doesn't have a hand-stamped greeting but still says love and 'anniversary' depending on how you present it. Send a hand-stamped card this year and send some love to celebrate life!